Provides a list of books in series. Searchable by author or title of series. Developed and maintained by Kent District Library in Kent County, Michigan. Search and view full-text eBooks. Download ebooks and eaudiobooks from the library website. Transfer the titles to your ereader or MP3 player. Get the app and access downloadables directly on your smartphone or tablet. These items check themselves in automatically; no overdue notices or fines. Complementary to Overdrive, Hoopla offers an expanded library of digital content not limited to eBooks. Hoopla also provides acces to streaming movies, music, comics and TV series. Provides citations to education literature and resources. Geared for Educators. Includes full text for nearly 520 high quality educational journals. For students and adults alike, this encyclopedia indexes over 25,000 records, covering an array of topics. Full text for each entry is easily accessed by double clicking on the topic. This encyclopedia offers images, brief biographies and a variety of subject areas. The encyclopedia is updated annually. Census records and indexes, vital, church, military, and many other types of records. A great resource for census data, family records, local histories and Revolutionary War pension records. Designed to support the information needs of patients, and to foster an overall understanding of health-related topics. Covers all areas of health and wellness including holistic medicine. Instructions for registering, information for getting assistance online and in person, tools for preparing for the test. Discover how to use homework tools at the library right from your home computer! Provides core resource of scholarly information for academic institutions. Contains full text for more than 2,100 journals and over 1,700 peer-reviewed journals. Contains complete magazine articles, photos, flags and maps on a variety of topics including business, health, education, general science, and multicultual issues. Articles deal with interesting people, places, customs, activities and nature on a worldwide scale. Also covers National Geographic Society expeditions and discoveries. The new course provides adults more flexible and convenient options to become hunter-education certified. JEFFERSON CITY, Mo. 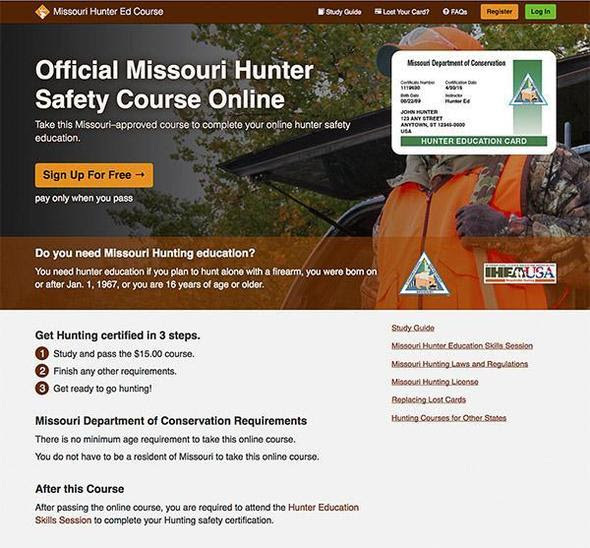 – Missouri Department of Conservation (MDC) offers an all-online hunter-education course for Missouri residents 16 years or older to provide a more flexible and convenient option to become hunter-education certified. The all-online course includes videos and animation to teach hunter safety, firearm safety, ethics, regulations, and wildlife management. Students will receive a temporary hunter-education certificate once they complete and pass the 60-question final exam with an 80% or higher. Individuals 15 years or younger are still required to complete the blended hunter education course requiring both a knowledge portion and in-person skills session to receive certification. 15 years of age or younger and will be hunting with a properly permitted adult mentor 18 or older. Born before Jan. 1, 1967. Disability exemption from MDC’s Protection Division. 16 years of age or older and have purchased an apprentice hunter authorization and will be hunting with a property permitted adult mentor 18 or older. Landowner or lessee hunting on self-owned land or land of residence. Learn more about MDC’s hunter education program, including the online option at http://on.mo.gov/2suc7sc. For more information about hunting seasons, go to: http://on.mo.gov/1YYbxMZ. MDC offers an all-online hunter-education course for Missouri residents 16 years or older to provide a more flexible and convenient option to become hunter-education certified. In addition, the library maintains the local newspaper on microfilm dating back to as early as 1878. This collection is not consecutive, particularly in the earliest editions. Newspaper Source™ provides cover-to-cover full text for more than 40 national (U.S.) and international newspapers, including Christian Science Monitor, USA Today, The Washington Post, The Washington Times, The Times (London), Toronto Star, etc. The database also contains selective full text for more than 370 regional (U.S.) newspapers. In addition, full-text television & radio news transcripts are provided from CBS News, CNN, CNN International, FOX News, NPR, etc. An online resource for academic and employment test preparation. Includes the GED, ACT, SAT, Postal Worker, and Civil Service tests. The site also offers materials and courses to improve life, workplace and computer skills. Great for science projects!!!! Contains full text for hundreds of science encyclopedias, reference books, magazines and other sources. Topics covered include biology, chemistry, earth & space science, environmental science, health & medicine, history of science, life science, physics, science & society, science as inquiry, scientists, technology and wildlife.